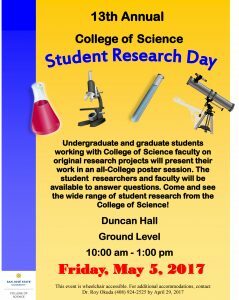 San Jose State University’s Office of Research and Research Foundation will host the 39th Annual Student Research Forum April 17, from noon to 2 p.m. in the Dr. Marthin Luther King Jr. Library, Room 225. The event is an opportunity to congratulate the outstanding SJSU Student Research Competition finalists who will be representing the university the CSU-wide competition May 4 and 5, at CSU, Sacramento. 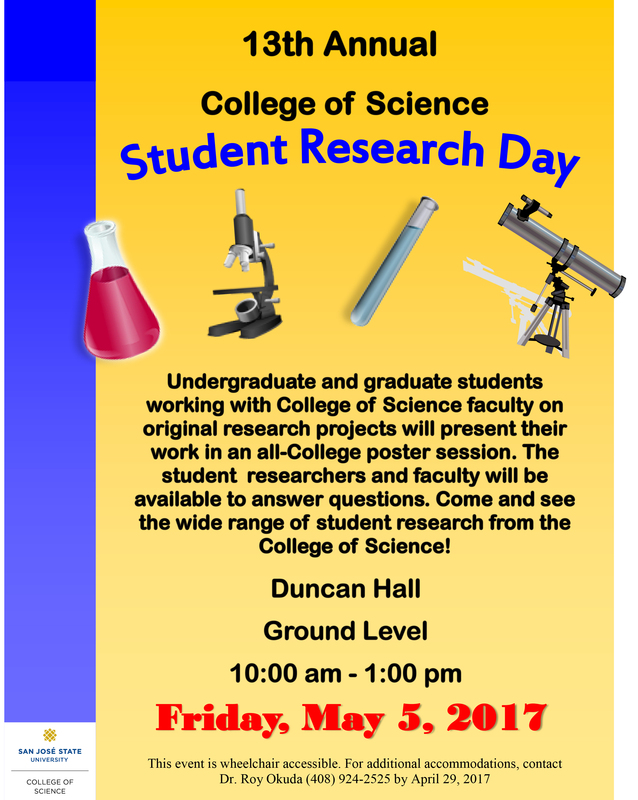 The event will include an awards ceremony recognizing the students and their faculty mentors, followed by a reception and poster session. In its most ambitious annual program yet, the Center for Literary Arts at San José State University brings to Silicon Valley three 2016 Pulitzer Prize-winning writers. For $100, patrons of the arts, be they paupers or kings, can hear, meet and converse with all three of the 2016 recipients of the nation’s most prestigious literary awards in ﬁction, autobiography, and poetry. Our first speaker for the season, Viet Thanh Nguyen, was named a 2017 MacArthur Genius for his work in nonfiction and fiction. 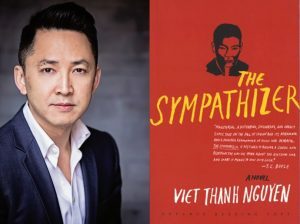 Nguyen, who won the Pulitzer for fiction for The Sympathizer, a story of espionage during the Vietnam War, grew up in San Jose in the 1970s and 1980s as a refugee. His parents founded one of the city’s ﬁrst Vietnamese groceries. 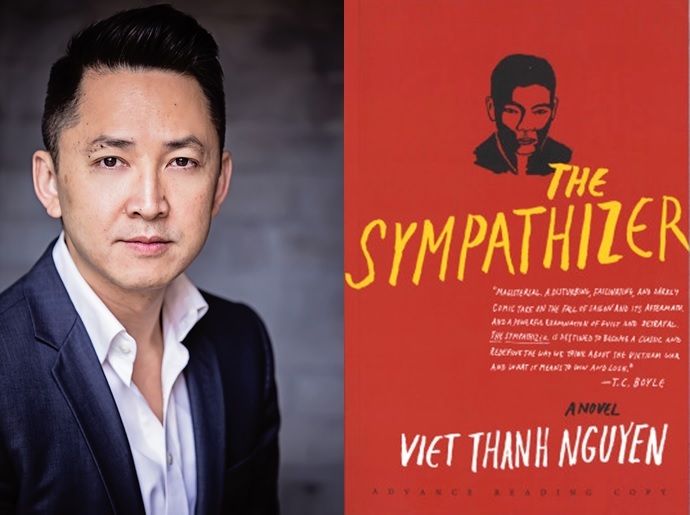 The Sympathizer’s nameless main character, a communist spy, expresses a Vietnamese perspective on the war, American politics, and Hollywood’s treatment of the Vietnamese people. Nguyen has become an international literary star, writing ﬁction and nonﬁction about the war and the global diaspora of Vietnamese people. He recently appeared in Elle France magazine. His story, “I’d Love You To Want Me,” from his new short-story collection The Refugees, appeared in Russian Esquire. In conversation with San Francisco writer Andrew Lam, himself a Vietnamese refugee, Nguyen speaks at 7 p.m. Oct. 18 at the Hammer Theatre Center, 101 Paseo de San Antonio Walk, Downtown San Jose. California surfer and international political journalist William Finnegan, author of the autobiography Barbarian Days: A Surﬁng Life, described himself as a young man as “general prick,” in a December 2015 interview. He was so fanatical about surﬁng, he said, that he had no time or interest to give to girlfriends, even those he loved. Finnegan, currently a staff writer for The New Yorker, spent nearly four years beginning in 1978 surﬁng the world’s beaches, then decades fermenting his autobiography, even as he earned national writing and journalism awards covering politics and wars in South Africa, Mozambique and Mexico as well as U.S. immigration and what it’s like to be an American teenager. William Finnegan speaks in conversation with author Steve Kettmann and reads at 7 p.m. Nov. 8 at Cafe Stritch, 374 S. 1st St., San Jose. Tickets for each event may also be purchased individually, with student discounts available. Visit www.litart.org for details. 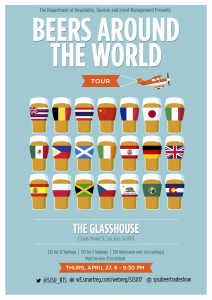 Students in the Hospitality, Tourism and Event Management Department will be hosting the spring 2017 Beers Around the World Tradeshow on April 27, from 6-9:30 p.m. at the Glasshouse, 2 South Market St., in San Jose. The event is open to SJSU faculty and staff, 21 and older. 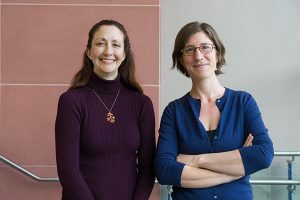 The once-a-semester event allows students enrolled in a meetings and event management course to gain practical planning experience while students in a Beer Appreciation course share what they’ve learned about beer and food pairings, as well as the history and culture of a particular beer-making region. 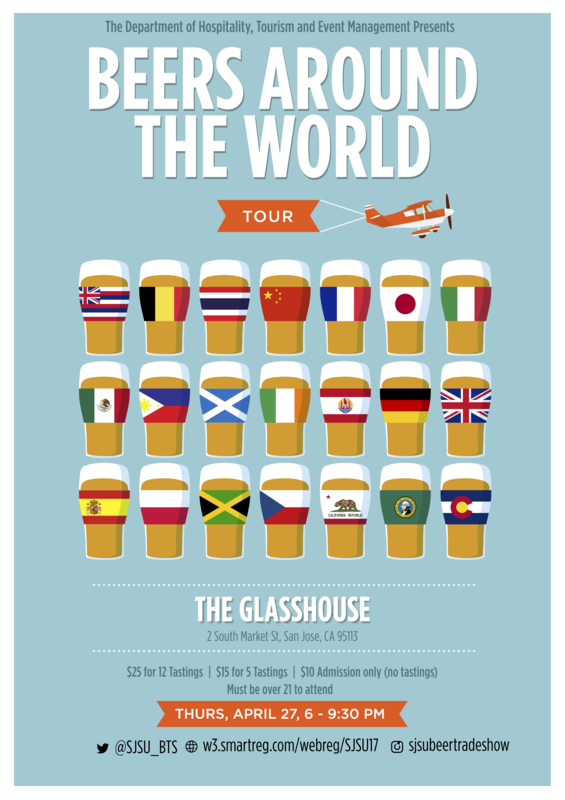 Tickets are $25 for 12 tastings, $15 for five tastings or $10 for admission only (no tastings). RSVP and purchase tickets online through April 20.